First capital of united Krypton. 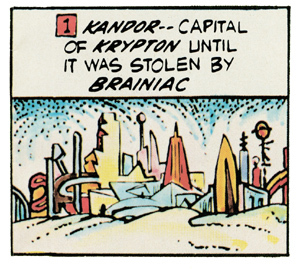 Kandor was stolen by the space-villain Brainiac, shrunk, and placed in a bottle. After defeating Brainiac, Superman took the bottle to his Fortress of Solitude till he found a way to enlarge it on the planet Rokyn.